Ama_Zone 1: Black-Waters (2011) is an album of field recordings by Artificial Memory Trace, also known as Slavek Kwi. His presence in the Amazon is so pervasive that there's a creek named after him. And perhaps some of the sounds on this record come from that creek. I wouldn't know, because although he provides liner notes, he also asks us not to read them, and I don't. Kwi presents the field recordings in an untouched state, but sequenced and layered in a manner that doesn't let us forget the author's hand. I like that, especially when disparate sounds collide, as they do on "Scene 13", the longest track here, and perhaps the highlight. Kwi is nothing if not prolific. Just now he released the double album Mmabolela with David Michael (here) and Anouran Love Songs, a triple album on USB flash card (here). Both on the incredible German label Gruenrekorder. That outlet also released my collaboration with David Colohan, "...between..." at the beginning of the year. It's not like me dwell on my own releases, but there is something about these imaginary landscapes, created in the space between field recordings and studio production, that keeps even me listening. The pieces encourage close listening and curiosity in a way that most "untouched" recordings do not. I remain very proud of these compositions. The digital release, complete with a suite of photographs, is available here. Previously unheard sounds are often the target of those who record from nature. David Dunn is one of the masters, though he languishes in relative obscurity. The Sound of Light in Trees (2006) is one long recording of bark beetles in Pinyon trees. It is extraordinary, unfolding over time like a fine electroacoustic composition. His actual compositions, all made for specific environmental constraints, may be found on the rather obscure double CD Music, Language, and Environment (1996). The oldest of these pieces dates from 1973. "Nexus 1" is performed by three trumpeters in a remote part of the Grand Canyon National Park. Inspired by Gregory Bateson, Dunn was very much ahead of his time with regard to the creative possibilities of environmental sound. He too lets accidents happen, and in fact creates conditions ripe with such possibilities. There's a remarkable moment at the eight-minute mark when the trumpets give way to echoing crows, with what must be passing aircraft for accompaniment. The 22 pieces are mostly short field recordings, but have an overt musical component that is inappropriate, I believe, for a book of research. Not all sounds need to be smothered in musical aesthetics. This is not to say that the recordings are of no interest. I particularly enjoyed "Escalator Transformator" by SchneiderTM. But I include this title in my list not so much as a recommendation as a warning against this approach. 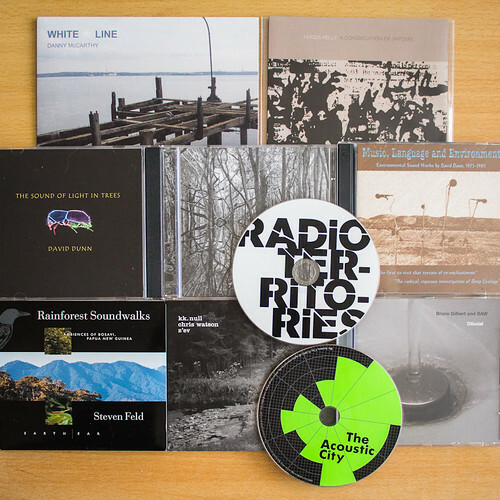 Radio Territories is another book with CD, this time edited by Erik Granly Jensen and Brandon LaBelle. I have long been interested in, and involved with, radiophonics, but for some reason didn't grab this particular volume until 2014. The compilation starts with a didactic reading (never a good idea) but then opens up to manipulations of radio call signs, Jupiter's radio transmissions, and minimal electronica that apparently has something to do with a site-specific car radio installation. From there things get even more creative, in a wonderful open way that a textual description such as this one cannot do justice. An excellent CD. I've been reading ethnomusicologist Steven Feld recently, particularly his experiences with, and interpretations of, the people of Bosavi, Papua New Guinea. He has released several albums of their native musical practice, which is sadly now lost to Christian missionaries and economic pressures. Voices of the Rainforest (1991) was part of a series curated by Mickey Hart. It contains wonderful recordings of work songs, ceremonial practice, and jungle ambience. To complement these, Feld released Rainforest Soundwalks (2001), which consists of four long ambient tracks, deliberately mixed to create a hyperreal experience, as Feld himself notes. If you want to turn your living room into a jungle, this is the record to get! You might also turn to Chris Watson for such a task. And certainly he has released many popular albums of location recording. One lesser-known venture was a collaboration with KK Null and Z'ev, instigated by the percussionist known for his diverse practice and eclectic taste. Number One (2005) is an album like no other, a collision between three different sound worlds that creates an ever-stimulating cacophony. It is quite possibly the loudest thing ever released by the otherwise refined Touch label. Amazing. Closer to home, I need to warn you regarding Fergus Kelly's A Congregation of Vapours (2012). Turn down your speakers! Otherwise the first track might do them some serious damage. Created largely from no-input mixing and speaker feedback, this album will challenge your sound equipment and your ears, but is a must for any fan of noise music. Kelly's experimental methods result in some incredible textures, so please listen beyond the opening barrage. This year he issued Unnatural Actuality, using some of the same techniques. Check out his Room Temperature label. "White Star Line" (2012) is a beautiful 7" inch single from Danny McCarthy. Recalling that The Titanic's last landing was in County Cork, McCarthy went to the actual pier in Cobh and recorded the atmospherics. I am not entirely sure if it is deliberate, but these subtle sonic signatures tend to merge with those of the vinyl itself, an effect that might be enhanced by leaving your record outside for a long while before playing. That would be a different form of environmental music altogether. Last week I was down in Cork for the launch of a new project by BAW (David Crawforth and Naomi Siderfin) and Bruce Gilbert. This follows on the release last year of Diluvial, likely the most palatable release in Gilbert's catalogue. This sequence of tracks recapitulates the seven days of creation from the Christian Bible. Though I was surprised by the use of this conceit, and the generally calm proceedings, I enjoyed the way random noises overlay the harmonic drone bed. So that makes twelve published recordings I listening to in 2014, even if only two of them were released in that year, even if most of them would not normally get classified as "music". They are certainly not top 40, but are continuously intriguing. Those with open ears will enjoy them.